Suspended in the gallery space are two elegant circular tables with cut out centres. 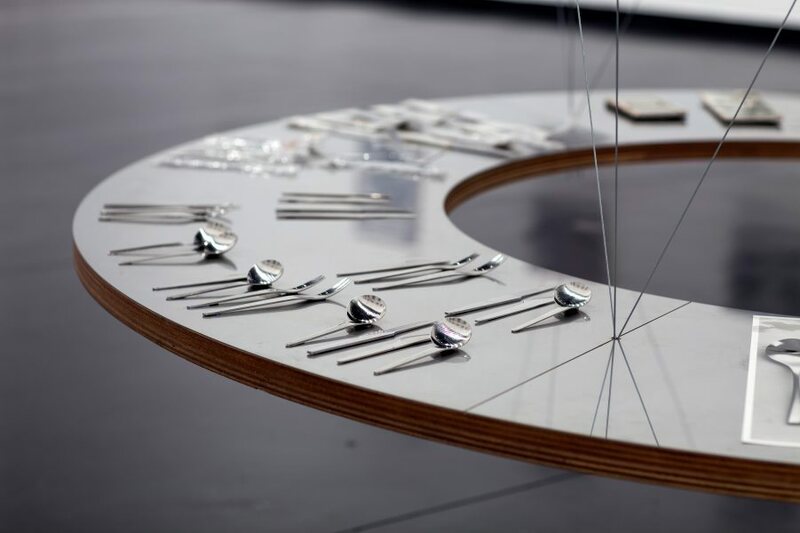 Their polished stainless steel tops are laid with an array of objects, including a number of partial cutlery settings, typed transcripts, photographs, and framed petit point embroideries. The hovering tables are derived from architect Albert Frey's suspended dining table in his 1947 house in Palm Springs, California, and are highly satisfying examples of modernist design. 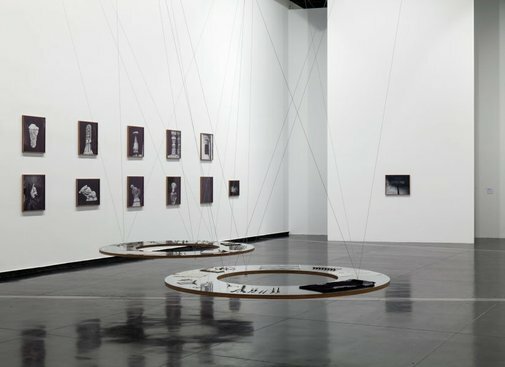 They are also presentation devices, requiring the viewer to move around their forms looking at the objects arranged both aesthetically and as a type of evidence, thinking through the history of these pieces and what may connect them. 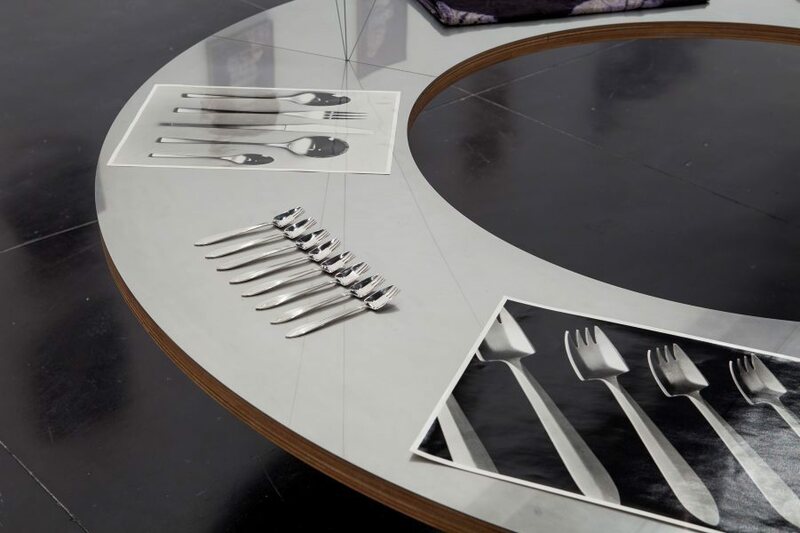 The clusters of cutlery suggest we may have a place at this reflective table, and yet these are the tools for eating that appear in design museums as exemplars of highly stylised mid-twentieth century refinement and technical innovation-a type of cutlery that sometimes proves difficult to use for its intended function. The majority of the cutlery is made of stainless steel, a non-rusting steel alloy developed in the early 20th Century and which was used extensively in manufacturing cutlery in Sheffield, England. While stainless steel was developed simultaneously in Germany and the USA, at Sheffield it was discovered during experiments to find a corrosion-resistant metal alloy for manufacturing guns. Also on the table are copies of transcripts from the Ploughshares Four court case, and it is from the court-designated number for this case that the work takes its title, 'Case No: T961301'.The Ploughshares Four are peace activists Joanna Wilson, Lotta Kronlid, Angela Zelter and Andrea Needham, who, in 1996, broke into Hawker Siddley's Lancaster plant near Preston and extensively damaged a Harrier jet that had been made for Indonesia and which was likely to have been deployed against the East Timorese. The name 'Ploughshares' comes from a movement that originated in America and which follows the biblical exhortation against weaponry and war: "…they shall beat their swords into ploughshares, and their spears into pruning hooks: nation shall not lift up sword against nation, neither shall they learn war any more" . The Ploughshares Four were open about their attack on the aircraft, which they effected with everyday tools, and left a video in the cockpit explaining their motivation. Controversially, all four were acquitted; their defence that they were preventing was upheld. 'Case No: T961301' was made for ARTTRANSPENNINE98,  an exhibition drawing reference from the Transpennine region of England in which Liverpool, Sheffield and Preston are located. It was presented at the Tate Liverpool Gallery, from which the court where the Ploughshares Four were tried is visible. The petite points in found silver frames further locate this narrative, as their subject is the nearby sugar stores that belonged to Tate & Lyle, the company from which sugar magnate and Tate Gallery founder Henry Tate derived his fortune. Jubelin, as always, has woven a skein of references across her work that traces narratives across time and place. 'Case No: T961301' was later exhibited in her exhibition Ecru in Lisbon,  which brought together the works she had made addressing Australia's tacit support through trade of Indonesia's takeover of East Timor after Portugal's withdrawal in 1975. Jubelin's intensive research-based practice always connects objects and images with narratives of commerce and power in what can be unexpected ways-in this instance, the Ploughshares Four court case had revealed that one of the common instruments of torture used against the East Timorese was everyday cutlery.